Time to gear up!!! Blowup!! is an iOS puzzle game where you try to connect eight or more of the same colored blocks to blow them up. Developed by Cravemob, the application works on the iPhone, iPod Touch and the iPad. I am not much of a music person but this app has some of the best music I’ve heard in a long time, in or out of a game. Try to connect as many of the same colored blocks to transform them into robots which in turn will blow up. The music in this game changes depending on how far you can last. 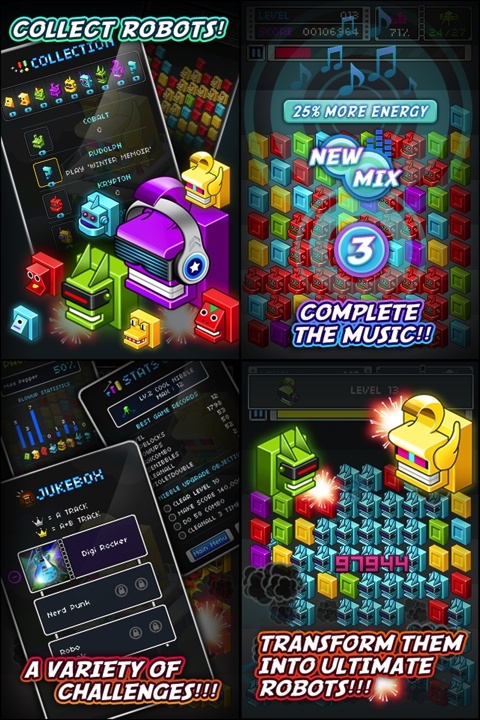 One song can have a variety of mixes which adds an addictive quality to the game just to hear them all. Right now you can download Blowup!! for free during a limited time event, so don’t delay. Blowup is a simple yet hard to master puzzle game especially with songs with a higher difficulty. The higher the difficulty, the faster the energy drains. Difficulty will pick up but at a reasonable pace. Random blocks will fill the screen and you remove the ones you think won’t give you an advantage. New blocks will replace the ones that are gone. Tapping a block twice will remove it and the same for a group of blocks. You do this until the energy meter runs out. Energy can be gained by removing eight or more blocks. Removing a single block will cost you a nibble. You start with a few and can refill it when you blow up thirteen or more blocks. You can increase the maximum amount of nibbles by completing nibble upgrade objectives. Nibble objectives, your statistics, and music objectives can be found on the pause menu. Certain robot forms will either clear the screen or change other colored blocks into a certain color. Violet blocks will give you more points and energy if you can gather them and blow them up. Blowup has Game Center support and keeps track of high scores locally, friends score during the week, and the world during a week. The 2D graphics in Blowup look sharp with some pixelation. The blocks transform into different types of robots. Most of the robots are named after elements from the periodic table while some look like Rudolph and a king. These can be unlocked by making a certain amount of a given element and can be changed in the collection menu. Blocks will fade, float away, explode, change colors, and transform into robotic heads. The game will show you important information. Sometimes this is a little annoying since it stops the game for a few seconds. Other than that the graphics are enjoyable. To reiterate, music in Blowup is amazing. One track sounds like something from Mario but maybe that’s because of the sound effects. Another track has a take on Jingle Bells. And just when you think you’ve heard it all, this app changes the music and makes it even better. It may add a new instrument or someone singing. When you beat a song with one hundred and/or two hundred percent, you can listen to tracks A and or B. This feature can be found in the jukebox. Overall, the level of work gone into the audio for this app is outstanding and I think it outshines many other iPhone apps out today. Blowup!! normally sells for $1.99 in the iTunes App Store. It is a bit expensive to me since there are also two in-app purchases. The purchases are Midnight City with three songs and Connection which has two songs. Both of them are $0.99 each. There is a free version so you can give it a shot if the price is too steep. You can save and quit and continue where you left off whenever you want. New updates may add new songs and/or fix some problems. After I updated, this app has been crashing randomly on my iPod Touch 4G. Before this, it was working perfectly. I hope this will be fixed. The crashing and buying new songs are the only things that bother me but I’m willing to put that aside because I think this is one of the best puzzle apps I’ve played so far. Blowup has very memorable music and I hope you will give it a chance. AppSafari review of Blowup!! was written by Tony Lau on February 29th, 2012 and categorized under App Store, Featured, Games, iPad apps, Music, Puzzler, Universal. Page viewed 3542 times, 1 so far today. Need help on using these apps? Please read the Help Page.